Back with yet another cleverly titled sequel, the Fast and Furious franchise is once again breathing life into the careers of Paul Walker and Tyrese Gibson. As those who saw 2011’s “Fast Five” know, the series once known for illegal street racing is now more of an MTV version of “Ocean’s 11”. In this installment, Dominic (Vin Diesel) and Brian (Walker) reassemble their crew from the last film in order to take down an international criminal (Luke Evans) who knows the whereabouts of the previously-thought-to-be-dead Letty (Michelle Rodriguez). In exchange for their help, a government agent (Dwayne “The Rock” Johnson) will give them pardons to redeem the team from crimes committed in the previous sequel. The first thing that has to be said about this movie is that’s stupid. Very stupid. The average action film these days will have a certain amount of things happen that wouldn’t actually occur in real life. This makes for more interesting action sequences and an overall exciting time at the movies. However, that approach can only get a film so far. Around the time that Dom drives a car 80 miles an hour into a guardrail to propel himself to catch Letty, who has been thrown from the top of a tank with great force, only for the two of them to land on the windshield of another car without a scratch, you’ll either love “Fast and Furious 6” or punch your friend in the face for talking you into paying to see it. The worst parts of the film are when director Justin Lin and his team feel they need to provide over the top CGI to make a chase scene interesting. Fortunately there are a couple of action sequences that come off as fairly realistic, the best of which being a hand-to-hand fight between Rodriguez and MMA fighter-turned-actress Gina Carano. As Carano’s acting talent improves, she could become a great asset for future action films (Hello, Lara Croft?). As for the few scenes of the film not involving exploding airplanes on 40-mile runways, there’s a lot left to be desired. You shouldn’t really expect a good script in a film that has a 6 in the title, but some of the stuff found here is laughable. There’s even a character with long-term amnesia. In 2013! There seems to be a myth that “Fast Five” and this current film turned a laughable franchise into something of a great action series. Personally speaking, this is not the case. These films are as mediocre and “dumb fun” as they’ve ever been. The only things that have really changed are the scale of the story and the size of the cast. 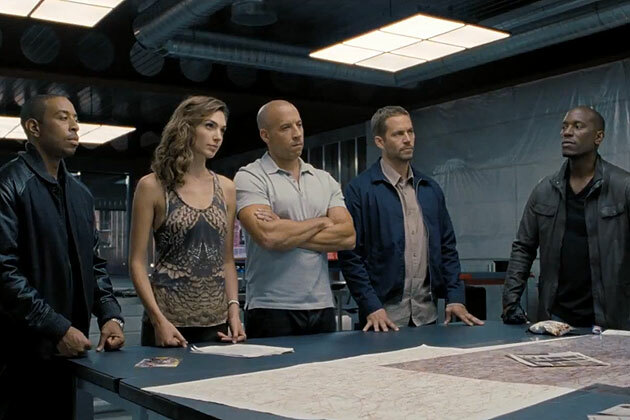 “Fast and Furious 6” isn’t a terrible film. If you can sustain ludicrous action sequences and poorly-written dialogue, you might even say it’s a really fun movie. Just don’t try to say it’s a great film. Here’s to hoping films 7, 8 and 9 actually live up to the hype. 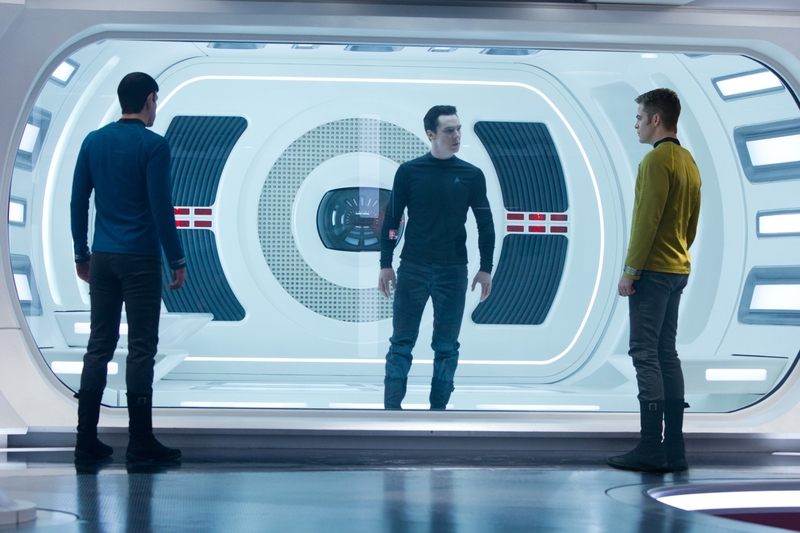 Once again, JJ Abrams takes us into his interpretation of Star Trek, where the inside of a spaceship is brighter than the stars it is passing by. Sorry, I’m trying to get all references to lens flare out of my system so we can all move on. “Star Trek Into Darkness” opens with the Enterprise crew visiting a primitive planet to stop a volcano from killing the locals. In the process, they fail their prime directive and Captain Kirk (Chris Pine) is once again reprimanded for ignoring regulations. Around the same time, a bombing by one of their own rocks Starfleet and leads to the deaths of many of their senior officers. Kirk is then reinstated to lead a vengeful mission to find the man responsible (Benedict Cumberbatch). If you don’t want to know who Benedict Cumberbatch is playing (hint: It’s not John Harrison, the name he is originally given in the film), then I suggest you stop reading now and come back later. It hasn’t been the best kept secret, but I’d rather have a pointless disclaimer than ruin the film for someone. The great thing about “Into Darkness” is that we finally get to see Kirk not being the douchiest character known to man. Sure, he got to be more likable by the end of the 2009 film, but he still didn’t seem like much of a leader. Here we get to see Pine playing the character a little more maturely and Kirk even starts to form a serious friendship with Spock (Zachary Quinto). Other characters who finally get to breathe a little are Uhura (Zoe Saldana) and, to a lesser extent, Scotty (Simon Pegg). Although many of the original Trekkies don’t care for how much this new series resembles Star Wars with its big space battles, these scenes are pretty well done here (especially a scene where one ship overtakes another mid-warp). That being said, I do hope in the future these films find a way to make a story happen on a planet not called Earth. There’s minimal trekking going on and it seems a more accurate title for the series would be “Starfleet”. Hopefully all of our Cumberbatch spoiler people are gone because I want to talk about his portrayal of the legendary Star Trek villain Khan. Once made popular by Ricardo Montalban, Cumberbatch doesn’t look a thing like the original villain. Nor does he really act like him, aside from being wrathful and overall not a person I would want to upset. However, the actor’s interpretation of the character is very fun to watch. Without chewing up the scenery, Cumberbatch delivers a deliciously evil bad guy that makes Eric Bana’s Nero seem like a cat stuck in a tree. There are two complaints I have about Khan, neither of which are the fault of the actor. 1) If JJ Abrams wants to pull off the “Can we trust him or not?” idea halfway through the film (you’ll know it when you see it), it would have been better to not make Khan look like the devil himself leading up to this point. 2) Why is the character not in the film more? Khan has maybe 4 or 5 scenes where he’s talking a substantial amount of time and the rest of the film he is given relatively no dialogue. To use an analogy from the Nolan Batman films, Khan is the Joker, but he gets as much screentime as Scarecrow. The biggest problem with “Star Trek Into Darkness” is that it doesn’t know if it wants to be a new Star Trek film or just a remake of “Star Trek II: The Wrath of Khan”. If the whole point of an alternate universe in the 2009 film was to destroy expectations and make your own films, why would you copy several scenes and lines of dialogue from 1982? Despite this confusion, “Into Darkness” does provide many of its own ideas and pulls off a very exciting sci-fi film. This is a promising sequel for the Star Trek franchise, but we’ll have to wait and see what happens in the next few years, as JJ Abrams will now take over the Star Wars sequels. I haven’t been this torn over a comic book film since last year’s “The Amazing Spider-Man.” So, like, two superhero films ago? Robert Downey Jr. returns as Tony Stark for the 4th time in “Iron Man 3” and this time we get to see more than his face inside of a helmet. The film takes place sometime after the New York showdown in “The Avengers,” an event which still give recurring nightmares to Stark and maybe just a hint of PTSD. Pepper Potts (Gwyneth Paltrow) and company have gone back to business as usual, but a new villain (Ben Kingsley as the Mandarin) has emerged and his public broadcasts/attacks have quite a few people upset. After Happy (Jon Favreau, former director of Iron Man films and current “Guy who’s always with Tony but I don’t actually know his name”) is put into a coma by one of the Mandarin’s men, Stark vows revenge against the international terrorist. Before I get to the part of the movie that bugs me (and apparently half the viewing audience), let’s talk some positives. As far as action scenes go, this is the best the Iron Man series has offered. There are two scenes where Tony gets to show some actual fighting skills outside of his suit that are both very enjoyable. The finale of the film, while maybe not as exciting as it could have been, is also one of the best sequences in the series. A big reason for the boost in action quality is new writer/director Shane Black. Known for his involvement in several action films like “Lethal Weapon” and “The Long Kiss Goodnight,” Black is not exactly new to the genre. There also many callbacks to his films like “Lethal Weapon 2” and “Kiss Kiss Bang Bang” that should make fans of the director happy. 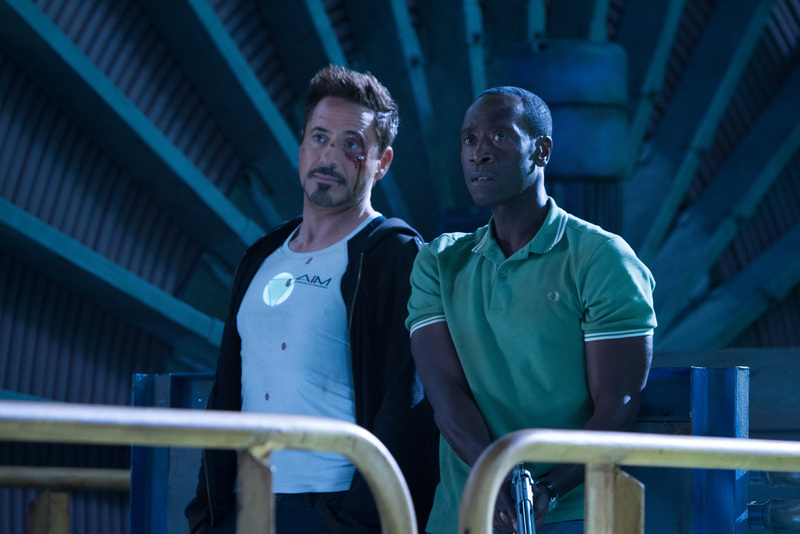 Unfortunately, whether it’s Black or co-writer Drew Pearce, the writing in “Iron Man 3” is not so great. I’m hesitant to use the term “plot hole” but there are several elements of the film that could have been handled better or written more understandably, one of which is the big twist. Matthew McConaughey might have finally redeemed himself. After several years spent in a minefield full of films like “Surfer, Dude” and “Fool’s Gold,” the actor is on a serious hot streak. Starting with 2011’s “The Lincoln Lawyer,” McConaughey slowly started to act more with his shirt on than off and really got into his role with “Killer Joe” a year later. That brings us to “Mud,” a film that shows the gritty, small town life of the South. When 14-year-old Ellis (Tye Sheridan) and Neckbone (Jacob Lofland) discover a stranger named Mud (McConaughey) living in their abandoned boat, he enlists them to help in the restoration process. Hoping to reunite with his lover (Reese Witherspoon) before his sins catch up to him, Mud needs his new boat in order to dodge the law and a more dangerous enemy. The South is one place better known for its caricatures than for any honest representation, but “Mud” manages to accurately portray small-town life without sugar coating its problems. Using a great cast of characters and a perfect tone, the film is able to document many aspects of Southern living without retreading the work of previous films. And really, what could make a film more Southern than a few Piggly Wiggly references? Speaking of that great cast of characters, McConaughey isn’t the only one lighting up the screen. Michael Shannon, Ray McKinnon and Sam Shepard all turn in great performances that make their seconday characters seem more lifelike. In a film that moves this slowly, that’s the difference between a great film and asking for a refund. The only character who’s really not that interesting is Witherspoon’s Juniper, a hot mess straight out of the trailer park. Though she’s more attractive than the average person you see in Arkansas, it’s hard to see why Mud goes to the lengths he does in order to keep her around. Another reason why “Mud” works so well is the direction of Jeff Nichols. In only his third directorial outing (the second being the highly-acclaimed “Take Shelter”), Nichols has crafted a masterful film that is perfectly paced. The 34-year-old is making quite the name for himself as both a writer and director, so I’m anxiously awaiting whatever his next project is going to be. “Mud” is half coming-of-age tale and half a slow crime thriller, teaching many lessons on naive youthfulness and unhealthy relationships. Despite only having one or two scenes that you could call “exciting,” the film’s pace and acting make 130 minutes fly by. “Mud” is more than a good film. Call it the first Best Picture nominee of 2013.